And (naturally) there is a graph to prove it. The Denver Broncos scored 38 points per game this year, an NFL record, led by Peyton Manning, who also set records for most passing yards and touchdowns by a QB in a season. Next week, they line up against the Seattle Seahawks, who own the league's top defense and the fifth-best overall statistical performance of any team since 1989. 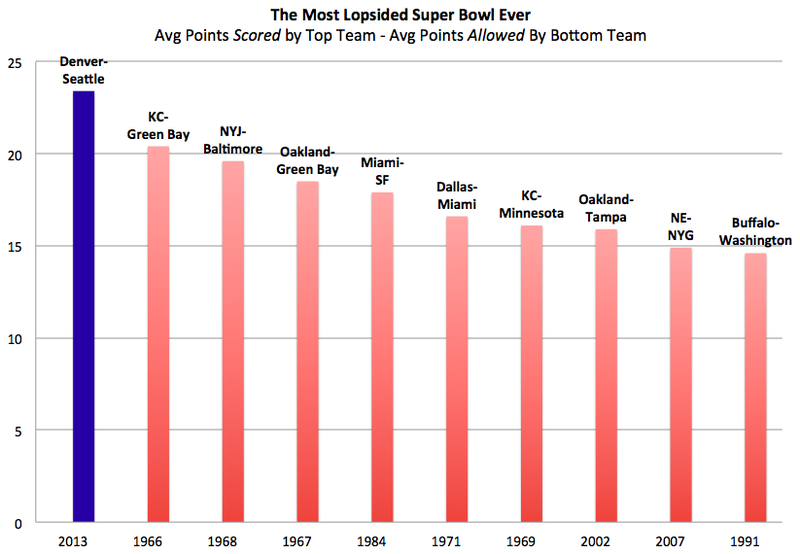 If those superlatives aren't enough to whet your appetite, consider this: The difference between the Broncos' average-points-scored and the Seahawks average-points-allowed this season is the widest in the history of the big game. It is what Chase Stuart of Football Perspective calls "the greatest offense/defense showdown in Super Bowl history." According to Football Outsiders, Seattle has the best defense in the league against the easiest schedule in the NFL (i.e. : the worst slate of offenses) and Denver had the best offense in the league against the second-easiest slate of defenses.